Bernard (1852) described an operation, repeatedly modified during the past century, for unilateral or bilateral reconstruction of the lower lip. Placing the incisions and Burow's triangles in the lines of the esthetic units yields a very good cosmetic result with acceptable mobility and width of the reconstructed lip. A turnover flap of cheek mucosa (S) is raised to restore the vermilion on the opposing de-epithelial-ized portion of the reconstruction flap (D) (Fig. 6.46a-c). Cutting along the nasolabial folds can give the mouth a froglike appearance, however, and so we prefer to cut from the angle of the mouth to the alar groove (Fig. 6.46c, d; see also Fig. 6.40). Meyer (1962) described a modification of the technique (Fig. 6.47a, b). Fig. 6.44 Modified Estlander flap (Brown 1928; Kazanjian and Converse 1974). (S), d All defects are closed. e, f Modification preserving the angle of the mouth (left side; Weerda and Härle 1981). Fig. 6.45 Unilateral or bilateral Gillies fan flap (1957). 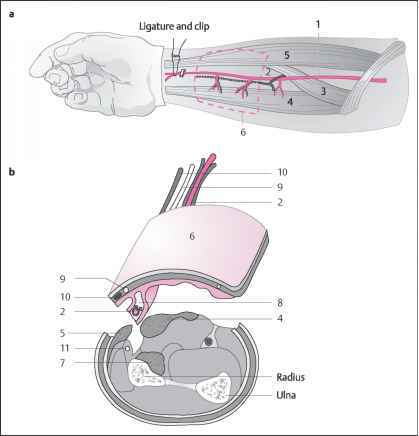 a The fan flap is basically a large two-layered Estlander flap that is rotated around the orbicularis oris muscle, if possible maintaining its neurovascular supply (see Fig. 6.29). A large Z-plasty (1 + 2) extends the reach of the flap. If necessary, Burow's triangles are excised to help close the defects. b Appearance after flap transposition and closure of all defects (see Fig. 6.28). Fig. 6.47 Meyer's modification a The triangles are cut lateral to the upper lip, and the cheek mucosa is incised and mobilized to cover the upper lip defects. Burow's triangles are excised in the cheek skin, turnover flaps of the cheek mucosa (S) are incised to restore the lateral vermilion defects. b The completed repair. Fig. 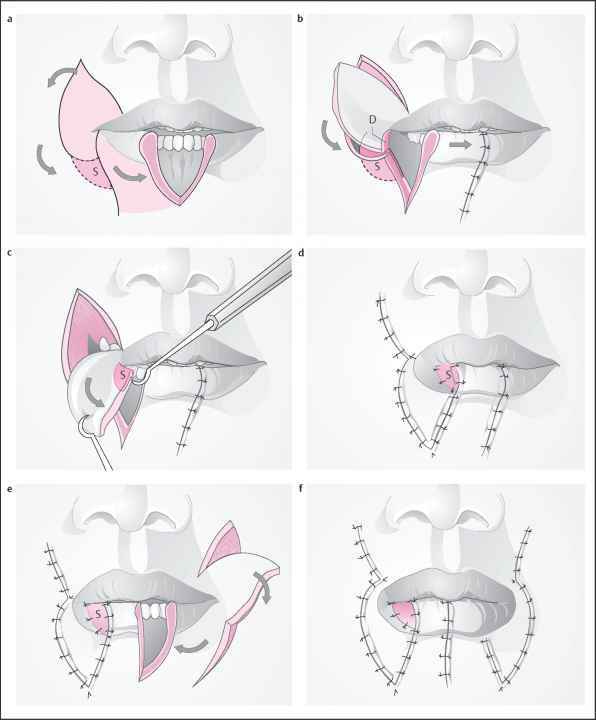 6.48 Lateral lip reconstruction by the method of Burow and Zisser. a Burow's triangle after tumor excision. The flap is transposed by cutting a three-layer Burow's triangle lateral to the lower lip. D = depepithelialized area b As in previous reconstructions, a flap of cheek mucosa (S) is used to resurface the de-epithelialized area.